Boycott Office, a specialized bureau of the Arab League. The boycott has three tiers. The secondary boycott extends the primary boycott to any entity world-wide that does business in Israel. A blacklist of global firms that engage in business with Israel is maintained by the Central Boycott Office, and disseminated to Arab League members. The tertiary boycott prohibits an Arab League member and its nationals from doing business with a company that deals with companies that have been blacklisted by the Arab League. Since the boycott is sporadically applied and ambiguously enforced, its impact, measured by capital or revenue denied to Israel by companies adhering to the boycott, is difficult to measure. The effect of the primary boycott appears limited since intra-regional trade and investment are small. Enforcement of the secondary and tertiary boycotts has decreased over time, reducing their effect. Thus, it appears that since intra-regional trade is small, and that the secondary and tertiary boycotts are not aggressively enforced, the boycott may not currently have an extensive effect on the Israeli economy. Arab League countries continue to support the boycott’s enforcement. U.S. legislative action related to the boycott dates from 1959 and includes multiple statutory provisions expressing U.S. opposition to the boycott, usually in foreign assistance legislation. In 1977, Congress passed laws making it illegal for U.S. companies to cooperate with the boycott and authorizing the imposition of civil and criminal penalties against U.S. violators. U.S. companies are required to report to the Department of Commerce any requests to comply with the Arab League Boycott. This report provides background information on the boycott and U.S. efforts to end its enforcement. More information on Israel is contained in CRS Report R44281, Israel and the Boycott, Divestment, and Sanctions (BDS) Movement, coordinated by Jim Zanotti. An official organized boycott of the Yishuv (pre-state Jewish community in Palestine) was adopted by the Arab League in December 1945, and persisted against Israel after the establishment of the State of Israel in 1948. The boycott was designed to weaken Jewish industry in Palestine and to deter Jewish immigration to the region. Although the boycott undoubtedly hurt Israel to some extent, it failed to cripple the country economically. Israel managed to build one of the strongest economies in the region, and managed to evade the boycott and clandestinely trade with the Arab and Muslim world through a number of countermeasures. The implementation of the boycott has varied over time among member states, and has since waned, with some states no longer applying the boycott. Egypt (1979), the Palestinian Authority (1993), and Jordan (1994) signed peace treaties or agreements that ended their participation in the boycott of Israel. Mauritania, which never applied the boycott, established diplomatic relations with Israel in 1999. Algeria, Morocco, and Tunisia do not enforce the boycott. In 1994, following the Oslo Peace Accords, the Cooperation Council for the Arab States of the Gulf (GCC) states, ended their participation in the Arab boycott against Israel. The move prompted a surge of investment in Israel, and resulted in the initiation of joint cooperation projects between Israel and Arab countries. In 1996, the GCC states recognized that total elimination of the boycott is a necessary step for peace and economic development in the region. While in its heyday, the Arab boycott had a moderate negative impact on Israel's economy and development, but also had significant negative effect on economic welfare in participating Arab countries, as the result of a deterioration in the foreign direct investment climate in the Arab world, and reduction in the volume of trade. In present days, the boycott is sporadically applied and ambiguously enforced, and therefore, no longer has significant effect on the Israeli or Arab economies. The boycott also negatively impacted other countries— particularly the United States during the Arab Oil Embargo in the 1970s. As part of the intercommunal conflict in Mandatory Palestine, some Arab leaders sought to orchestrate anti-Jewish boycotts from 1922.The original boycott forswore with any Jewish-owned business operating in Mandatory Palestine. Palestinian Arabs "who were found to have broken the boycott ... were physically attacked by their brethren and their merchandise damaged" when Palestinian Arabs rioted in Jerusalem in 1929. Another, stricter boycott was imposed on Jewish businesses in following the riots that called on all of the Arabs in the region to abide by its terms. The Arab Executive Committee of the Syrian-Palestinian Congress called for a boycott of Jewish businesses in 1933 and in 1934, the Arab Labor Federation conducted a boycott as well as an organized picketing of Jewish businesses. In 1936, the Palestinian Arab leadership called on another boycott and threatened those who did not respect the boycott with violence, however, this boycott was unsuccessful as Jewish lawyers, physicians, and hospitals were too heavily integrated into Palestinian society. The Arab League began to create the apparatus for implementing the resolution in February the same year. The first body established for this purpose was the Permanent Boycott Committee, based in Cairo, Egypt. On 12 June the Boycott Committee adopted a recommendation in Arab League Resolution 70, which called upon the Arab states to set up national boycott offices. Later measures adopted by the Committee included requiring those selling goods to Arab states to provide a certificate of origin to prove the goods were not manufactured by Palestinian Jews, the allocation of 50% of the value of goods confiscated in this manner to customs officials, the prohibition by Arabs of the use of Jewish banks, insurance companies, contractors, and transport in Palestine. Member states of the Arab League began implementing these resolutions through legal and administrative measures. After the Partition of Palestine into Arab and Jewish states was introduced at the United Nations on 29 November 1947, efforts to apply the boycott were intensified. However, the boycott was unsuccessful, as established in the first annual report of the Boycott Committee, and trade between Palestine (the vast majority by Jews) and Arab States neighboring Palestine continued to thrive. Following the Israeli declaration of independence on 14 May 1948, the Permanent Boycott Committee ceased to function upon the outbreak of war between Israel and surrounding Arab States on 15 May 1948, and the Arab League repeated its calls for a ban on all financial and commercial transactions with Palestinian Jews, boycotting the newly formed State of Israel. The Arab League cut off postal, telegraphic, and radio communications with Israel, and Arab States began to impose a land, sea, and air blockade on the fledgling state. Israeli goods, shipped through Alexandria, Port Suez and Port Said, were confiscated by Egyptian inspectors. A prize court established in Alexandria in 1949 authorized the seizure of cargo ships destined for Israel. In 1950, regulations were promulgated to allow the search of ships and aircraft and the seizure of Israeli-bound goods found within. The Arab-Israeli war ended on 10 March 1949 with a decisive Israeli victory. On 6 February 1950, King Farouk of Egypt issued a decree under which manifests and cargoes of ships could be searched to ensure that no "war contraband" was present on vessels bound directly or indirectly for Israel. War contraband included arms, munitions, and war material. However, article 10 additionally stipulated that other goods were to be considered "contraband" and were to be treated as war material — ships, chemicals, motor vehicles, money, gold, and fuel of any kind. At the time 90% of Israeli oil was supplied by Iran and imported through the Straits of Tiran. To prevent Iranian oil from entering Israel, Egypt blockaded the Straits of Tiran and the Gulf of Aqaba. Oil tankers proceeding through the Suez Canal were required to submit documentation to guarantee none of their cargo would arrive at an Israeli port. To enforce the policy of denying strategic goods to Israel, the decree authorized the use of force against any ship attempting to avoid search, including live gunfire, to make it submit to inspection. If a ship were to subsequently allow a search and reveal that they were not carrying any "contraband", the ship would be allowed to continue its voyage. However, if the ship resisted a search by force, it would be considered to have violated its neutrality. For this "hostile act", ships were to be seized and their cargo impounded even if they were not found to possess any "contraband". Ships found or suspected to transgress the Egyptian shipping practices delineated in this decree were blacklisted by Egypt and denied free use of the Suez Canal. The decree of February 1950 signaled a shift in the policy of the Arab League. The boycott's immediate purpose had originally been to prevent direct Arab trade with Israel (called a primary boycott). With this decree the boycott was expanded to the interruption of international trade with Israel (a secondary boycott). On 8 April 1950, the Arab League Council embraced this shift, approving a decision by its political committee to the effect that all ships carrying goods or immigrants to Israel were to be blacklisted. On 19 May 1951, the Arab League Council passed Resolution 357, which established a successor to the defunct Permanent Boycott Committee, the Central Boycott Office (CBO), with its headquarters in Damascus. Branch offices of the Damascus CBO were established in each of the Arab League member states. To direct the CBO the resolution created the position of Boycott Commissioner and provided for the appointment of his deputies, who were to function as liaison officers accredited by each member state of the Arab League. The primary task of the Damascus CBO was to coordinate the boycott with its affiliated offices, and to report regularly to Arab League Council. Biannual meetings were to be held each year after 1951 to coordinate boycott policies and to compile blacklists of individuals and firms which had violated the boycott. Each member state of the Arab League would enforce the resolution through legal and administrative measures. Finally, the resolution stipulated that "participation in regional conferences organized on the initiative of one country or by an international organization could not be attended if Israel were also invited", expanding upon its 1950 decree that such a conference would not be organized by an Arab state. Boycotts were almost exclusively applied against specific individuals and firms in third countries, and very rarely against the countries themselves, excluding a few short-lived boycotts of countries in the early 1950s. A plan was made by the Arab League in 1952 to boycott the Federal Republic of Germany after it signed the Reparations Agreement with Israel, which would provide Israel with restitution for the slave labor of Jews during the Holocaust and compensate for losses in Jewish livelihood and property that was stolen due to Nazi persecution and genocide. The Arab League strongly opposed the agreement, but its threats to boycott West Germany were never carried out due to economic considerations—the Arab League would be impacted far more negatively by losing trade with West Germany than vice versa. Similarly, at its second meeting on the boycott in 1953, the Arab League proposed a wide range of restrictions on trade with Cyprus, which had become a hub of illicit Arab-Israeli trade. The restrictions were greatly relaxed due to international criticism of the boycott of an entire state not involved in the Arab-Israeli conflict, but they were not completely eliminated. The boycott of third parties (secondary boycott) originally applied solely to funds and strategic commodities. However, on 28 November 1953, Egypt increased its disruption of Israeli maritime trade by expanding its list of "contraband" to include "foodstuffs and all other commodities likely to strengthen the potential of the Zionists in Palestine in any way whatsoever." By 1953 the Arab boycott was a well-established feature of international trade relations, and becoming more brazen. In early 1953 the first reports were released about Arab attempts to make American and European airlines boycott Israel by refusing to service Israelis or land in Israel, or at a minimum to not invest in Israel. This tertiary boycott marked another fundamental shift in boycott policy wherein Arab states would pressure third party states to agree to boycott Israel. However, these rudimentary efforts were unsuccessful and the airline boycotts remained isolated to the Arab world. On 11 December 1954 the Arab League Council passed Resolution 849, approving the Unified Law on the Boycott of Israel. The provisions of this resolution, implemented in legislation by most member states over the following year, formalized the application of the boycott in the Arab States uniformly. The resolution contained new recommendations prohibiting Arab entities and individuals from dealing with agencies of persons working for Israel, and with foreign companies and organizations with interests, agencies, or branches in Israel. The export of Arab goods to countries to be re-exported to Israel was criminalized with a penalty of large fines and hard labor. In the mid-1950s boycott activities intensified, and gained a new and highly powerful ally — the Soviet Union. During Israel's early years it was seen by the USSR as a potential ally due to the significant socialist aspirations advocated by its founders and applied in its conception. The Soviet Union was one of the first countries to recognize Israel de jure upon its establishment in 1948. However, as Israel's democratic nature became evident and its ties with Western states were solidified, the Soviet Union would view Israel as an enemy in the West vs. East dichotomy of the Cold War. Instead, the Soviet Union would form an alliance with the revolutionary Arab regimes, Egypt, Syria, Yemen, Sudan, and later in the decade Iraq, united in anti-American and anti-Israel political objectives. The clout of the Soviet Union gave the boycott new international legitimacy and guaranteed anti-boycott resolutions a veto at the UN Security Council. The tertiary boycott, formerly ignored as an affront to international trade relations, became enforceable through the sheer political and economic power of the Soviet Union. In 1958, Air France capitulated to Arab League demands after being denied overflight and landing rights in Arab states for eighteen months due to its alleged investment in Israeli development projects. With the success of the first tertiary boycott the Arab League became increasingly demanding of uninvolved states to adhere to its boycott of Israel. In 1958 the boycott was expanded to prohibit all goods exported from a third state identical to goods imported by the state from Israel, including goods produced with Israeli raw materials or components. In the same year, ships visiting an Arab port and an Israeli port within the same trip were blacklisted. The Arab boycott of Israel escalated with the 1973 oil crisis, when the members of the Organization of Arab Petroleum Exporting Countries (OAPEC, consisting of the Arab members of OPEC plus Egypt and Syria) announced an oil embargo in October 1973, following United States supply of arms to Israel during the 1973 Yom Kippur War, the first time the United States directly supported Israel in a war. The OAPEC embargo targeted Canada, Japan, the Netherlands, the United Kingdom and the United States. OAPEC threatened to cut oil production 5% monthly "until the Israeli forces are completely evacuated from all the Arab territories occupied in the June 1967 war...." The embargo lasted for about five months before it was lifted in March 1974. Following the Oslo Peace Accords, the Cooperation Council for the Arab States of the Gulf (GCC) states, ended their participation in the Arab boycott against Israel, and declared that total elimination of the boycott is a necessary step for peace and economic development in the region. A number of companies found ways of bypassing the boycott and managed to trade with both Israel and the Arab world. For example, some firms that did business with Arab countries officially complied with the boycott, but in practice subcontracted their trade with Israel to companies already blacklisted by the Arab states, while others did business with Israel through divisions or affiliates whose links to the company were disguised. Others strove to cultivate good personal relationships with Arab leaders, who would allow them to trade with Israel without economic repercussions in their own countries as a favor. Some firms placed on the blacklist managed to lobby or buy their way off it. Israel responded to the boycott by creating its own blacklist of firms that respected the boycott, and circulated them around the world to encourage Jewish-owned businesses to avoid dealing with them. In addition, Israel supporters in some Western countries managed to get anti-boycott laws passed, but they typically went unenforced everywhere except the United States. In 1977 the United States Congress passed a law that President Jimmy Carter signed, which made it a criminal offense to adhere to the boycott and imposed fines on American companies that were found to be complying with it. For the surveillance after the implementation of this law, an office called the "Office of Antiboycott Compliance" was opened in the US Department of Commerce. Despite the fines, there were some American companies (like McDonald's) which preferred to pay the fines and continue boycotting Israel rather than lose their business with the Arab world. Israel also took a series of steps to evade the embargo and clandestinely trade with the Arab world. Front companies in third countries were set up, which imported goods, then re-exported them to Arab countries with false labels and certificates of origin. In other cases, foreign companies would purchase Israeli technology and materials, use them to assemble completed products, and export them to Arab countries while concealing this fact from their customers. Arrangements with American companies were worked out where the American companies would buy goods from Israeli affiliates and export them as American-made goods. Israeli ships were re-flagged as ships of other nations and provided with faked bills of landing so they could directly export goods to the Arab and Muslim world. Greece and Cyprus were particularly popular hubs for smuggling Israeli goods into the Arab world due to their location, multilateral economic connections, large merchant fleets, and Cyprus' corporate and bank secrecy laws. Egypt was the first nation to abandon boycott, doing so in 1980 after signing a peace treaty with Israel the previous year. After more or less consistently adhering to the practice of seizing cargo bound for Israel since 1950, the Straights of Tiran and the Gulf of Aqaba were opened to Israeli trade and Israeli cargo went unmolested for the first time in decades. Afterwards, Egypt became a convenient destination to smuggle Israeli goods into the rest of the Arab world, as Israeli goods could be legally imported into Egypt and relabeled as Egyptian for trade with other Arab countries, although the treaty led to other Arab countries becoming more suspicious of Egyptian products. By the late 1980s, Israel's counter-measures against the boycott were proving a success, and the Boycott Office estimated that between $750 million to $1 billion worth of Israeli goods, or about 10% of Israel's exports at the time, were reaching Arab markets per year. In 1995, a year after it signed a peace treaty with Israel, Jordan lifted its boycott. The Palestinian Authority likewise agreed not to abide by the boycott that same year. In 1994 several of the Arab states of the Persian Gulf abandoned the secondary and tertiary boycotts. The period also saw "low-level diplomatic relations" between Israel and Morocco, Mauritania, Oman, and Qatar. In 1994, following the Oslo Peace Accords, the Cooperation Council for the Arab States of the Gulf (GCC) states, ended their participation in the Arab boycott against Israel. The move prompted a surge of investment in Israel, and resulted in the initiation of joint cooperation projects between Israel and Arab countries. In 1996, the GCC states recognized that total elimination of the boycott is a necessary step for peace and economic development in the region. Algeria, Morocco, and Tunisia do not enforce the boycott. Mauritania, which never applied the boycott, established diplomatic relations with Israel in 1999. Saudi Arabia had pledged to end its economic boycott as a condition for membership in the World Trade Organization but came back on the promise following its acceptance into the organization in December 11, 2005. As the boycott was relaxed (or rather, not as stringently enforced) starting in the late 1980s and early 1990s, many companies which previously stayed out of the Israeli market had entered it, e.g. McDonald's and Nestlé. In 1985, the ban was lifted on Ford, which had been in place since the company had opened an assembly plant in Israel, and Colgate-Palmolive, although five other companies were added to the blacklist. Toyota began selling cars in Israel in 1991, although it claimed that it had never complied with the boycott, arguing that it did not have the resources to sell cars in the country. Today, most Arab states, Syria being the exception, no longer attempt to enforce the secondary or tertiary boycotts. Syria, Lebanon, and Iran (though not an Arab state) are the only states which actively enforce the primary boycott. The Central Boycott Office has become obsolete. With the vast majority of Arab states benefiting from trade with Israel, any "boycott" has become symbolic in nature, limited to bureaucratic slights such as passport restrictions. The Boycott, Divestment and Sanctions (BDS) movement was founded in 2005 in an attempt to increase economic and political pressure on Israel and advocates a total, international boycott of Israeli products, divestment of investments in Israel and sanctions. Besides anti-Israel economic measures, the BDS movement also strives to disrupt cultural exchanges and business involving Israel, Israelis and businesses which deal with them. In addition, sporting teams from various Arab states continue to boycott international matches when they are drawn against an Israeli team, choosing instead to forfeit the match. Today, 31 United Nations member states do not recognise the State of Israel, including 18 of the 21 UN members in the Arab League: Algeria, Bahrain, Comoros, Djibouti, Iraq, Kuwait, Lebanon, Libya, Morocco, Oman, Qatar, Saudi Arabia, Somalia, Sudan, Syria, Tunisia, United Arab Emirates, and Yemen; and a further 10 members of Organisation of Islamic Cooperation: Afghanistan, Bangladesh, Brunei, Chad, Indonesia, Iran, Malaysia, Mali, Niger, and Pakistan. In 2002, the Arab League proposed recognition of Israel by Arab countries as part of the resolution of the Palestine-Israel conflict in the Arab Peace Initiative. The passports of some countries are not valid for travel to Israel. These countries include Bangladesh, Brunei, Iran, Iraq, and Pakistan. 16 countries do not accept Israeli passports and eight of these also do not accept passports of other countries whose holder has an Israeli visa endorsed in it. The stamp may be a visa stamp, or a stamp on entry or departure. It can also include a stamp of another country which indicates that the person has entered Israel. For example, if an Egyptian departure stamp is used in any passport at the Taba Crossing, that is an indication that the person entered Israel. On January 7, the Israeli government published a “black list” of groups whose members will be denied entry to the country. The Israeli government has linked these organizations to the Boycott, Divestment and Sanctions (BDS) movement and banning their entry was part of a concerted effort by the Israeli government to counter BDS, viewed by Israeli leaders as a serious diplomatic threat. BDS is a loose amalgam of groups and individuals with varying political aims, who call for economic and cultural pressure on Israel in solidarity with the Palestinians, a call started by Palestinians activists. For some BDS supporters, the objective is merely to voice their opposition to Israel or to Israeli policy and military rule—occupation—of Palestinian people. For others, however, BDS is meant as a concrete strategy to achieve political goals: either an end to the occupation of Palestinians in the West Bank and the achievement of a two-state solution, or, conversely, the dissolution of Israel altogether and its replacement with a different state that includes the West Bank and Gaza Strip. For those BDS supporters aiming for a political outcome, the theory is that exerting pressure on Israel and on Israelis will make the status quo more costly to them, eventually forcing Israelis to opt for a different reality—either withdrawing from the West Bank or dissolving their own state, depending on the differing aims of the boycotters. The inspiration for the strategy and name comes from the international sanctions on South Africa that helped catalyze the end of Apartheid. The premise of the strategy is twofold, therefore: that international pressure will exert a dramatic toll on Israel and on Israeli citizens, and that Israelis will then see and opt for a political path out of this pressure. There is much to debate on BDS—and much ink has already been spilled—including on its choice of one single target in the world today, Israel, and on the diametrically conflicting aims of some of its promoters: either supporting an Israel at peace with a sovereign Palestinian neighbor, or a rejection of Israel outright as an illegitimate entity that should be replaced in its entirety. Different tactics naturally flow from these conflicting aims. The European Union, which has not endorsed BDS and has robust and open ties with Israel, has called for labeling products manufactured in Israeli settlements in the West Bank to allow consumers to specifically avoid these products. The E.U. signaled to Israelis two things at once: steadfast opposition to settlements, while rejecting the notion that the State of Israel was itself somehow illegitimate, as was the South African Apartheid regime in many eyes. In the Horizon 2020 scientific cooperation project, for example, the E.U. demanded that settlements be excluded even while offering broad and generous support for Israeli science and academe (among many other countries). With such a proposition, even an Israeli government led by Benjamin Netanyahu agreed to exclude settlements from the program, though E.U. was in effect trying to re-emphasize the Green Line that separates Israel from the West Bank, a boundary the Netanyahu governments, among others, have strived to blur. Unlike the E.U., the BDS movement promotes boycotts of made-in-Israel products across the board, boycotts of Israeli artists and academics, and even lobbying for official sanctions on the State of Israel by foreign governments and international bodies. This raises the important question of what signal would be sent to the average Israeli, ultimately the key player in the BDS movement’s own “theory of the case.” If Israeli voters are convinced, as many of them are, that BDS aims to eradicate their state rather than to end the occupation, they are hardly likely to oblige. Moreover, for a wholesale boycott of Israel to push Israeli citizens to make different political choices, it would have to have a dramatic economic impact. Would boycotts actually work? Would the Israeli public actually feel the economic pain? Israel suffered decades of Arab boycott, starting at its birth in 1948. In a primary boycott, Arab states didn’t trade with Israel, making it an economic island. This raised the costs of trade considerably, making the country reliant on less secure supplies of basic commodities and energy resources. In a secondary boycott, Arab and other states threatened sanctions against firms that traded with Israel, dramatically limiting the number of companies willing to trade with the then-poor state. Common consumer goods of international brands—Pepsi, Toyota, and many others—could not be readily found in Israel, and, more important by far, Israeli industry could not rely on the inputs of a wide range of raw materials and industrial products from third parties who were fearful of the secondary boycott. 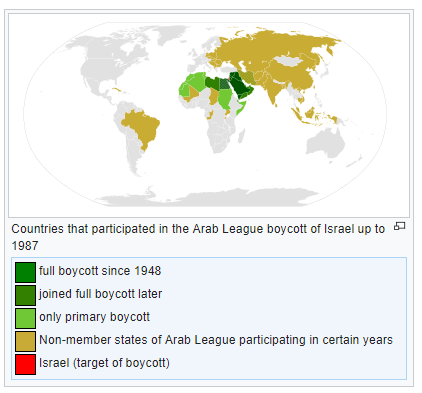 The primary boycott by Arab countries continues to some large degree (with the notable exceptions of Egypt, Jordan and the Palestinian Authority, which have official relations with Israel), but the far more damaging secondary boycott largely dissipated after the signing of the Oslo Accords in 1993. Israeli roads were suddenly flooded by major Japanese car brands, Pepsi was sold, and Israeli industry was unshackled. This helped boost the Israeli economy in subsequent years. The legacy of the Arab boycott also left the Israeli economy adept at dealing with such boycotts. Some Israeli firms are well versed in using third-country subsidiaries to bypass boycotts, where they still exist (such as in much of the Muslim world.) Much of the Israeli economy naturally grew to take advantage of opportunities that are less sensitive to boycotts. Today, the Israeli economy itself is far less susceptible to boycotts. A look at international trade data suggests that Israeli exports have evolved into being more unique and of higher quality, which implies that Israeli products cannot be substituted that easily by consumers. This means that successfully boycotting Israeli exports would be much harder today. 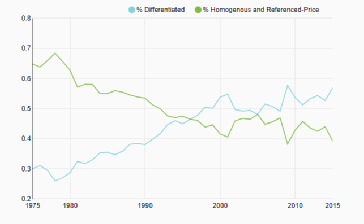 For one, as Figure 1 shows, Israel has been exporting more and more differentiated goods as opposed to homogenous goods, according to the categorization put together by the University of California San Diego’s James Rauch. The latter are goods that are easily substitutable (for most consumers, an orange is generally an orange, regardless of where it was grown), whereas the former term refers to goods that are traded in more narrow markets, and therefore are less prone to competition (a specialized computer chip, for example). Our analysis suggests that by 2015, about 50 percent of the value of Israeli exports were differentiated goods, an increase of about 15 percentage points since 1985. The trend in the data is clear: as the Israeli economy grew, the proportion of its exports that are differentiated goods grew as well. Note: We exclude from the graph “non-classified” products for visualization purposes, as they represent a very small share of the overall export basket. In fact, the export basket of Israel has consistently moved towards high-technology goods, including semiconductors and other computer parts, as well as advanced machinery, pharmaceuticals and other products that are not easily replaceable. Banning Israeli goods would affect consumers in countries that currently import those goods, and it would be too complicated even for activists of the boycott movement themselves. View a video of a BDS rally, and there’s a fair chance the footage was taken on a device that utilizes Israeli technology: The boycott is broken before it begins. The picture looked very different when the international community sanctioned the South African economy during the last decade of the Apartheid era: According to our analysis, the kind of goods exported by South Africa in the mid-1980s to mid-1990s were highly substitutable, unlike Israel’s today: more than 60 percent of South Africa’s export basket consisted of homogenous goods, such as minerals, metals, and agricultural products. At the time, imposing an import ban on South African goods would not create a large impact on the global consumer. Another measure that suggests the low substitutability of Israeli exports is the quality of its goods. 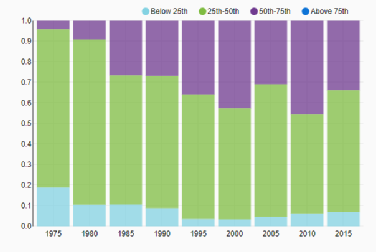 Using data on export quality, Figure 2 shows that over the past 30 years Israel has become increasingly an exporter of high quality goods (relative to other countries’ exports). In the early 1980s over 90 percent of the value of Israeli exports were below the median world quality, with barely 5 percent of its exports being above median world quality. Yet, as of 2015, almost 40 percent of Israeli exports are above median world quality with less than 10 percent in the bottom quartile. If high quality goods are harder to replace, this would again suggest that Israeli exports are, today, less prone to boycotts and import bans. By contrast, more than 70 percent of South African exports in 1990 were below median world quality, with more than half of such figure being below the 25th percentile. Note: We proxy trade quality data during 2011-2015 for each product with the correspondent 2010 values. Source: U.N. Comtrade; Feenstra and Romalis (2014), and authors’ calculation. Moreover, according to data from the World Bank’s World Integrated Trade Solution website, about 40 percent of Israeli exports can be classified as intermediate goods, meaning they are used in the production process of other goods produced elsewhere. This implies that Israel is quite integrated in global value chains, so that firms all over the world—and not only regular people—are importing these goods. Intermediate goods are also harder to target in boycotts, since many of them are not visible to the average consumer, and are “hidden” within the production process of a product of another country. Lastly, beyond exports, Israel (together with South Korea) leads the world in research and development (R&D) investment as a share of GDP (standing at about 4.5 percent). Israel is now home to major R&D centers—and in many cases even for production facilities—of some of the largest and most successful multinational corporations. This in turn contributes to the quality and differentiation of Israeli products and makes it even more difficult for firms to bypass Israeli industry and technology. Economically, therefore a consumer boycott seems less of a credible threat than either BDS, the Israeli government, or many in the United States seem to believe: it would be very hard to enforce a ban on commercial Israeli goods, from computer hardware and software, medical devices, pharmaceuticals, to advanced machinery in heavy industry. In other words, a significant portion of Israeli exports are in high demand—and this trend seems likely to continue—and most consumers (either firms or people) would be unable to replace them or unwilling to stop consuming them altogether. Of course, none of this implies that a boycott is no threat at all to Israel. Even though most products Israel exports are unlikely to be boycotted effectively, there is still a portion for which boycotts could work in theory: tourism, some agricultural products, non-complex manufacturing, as well as perhaps some services exports. Cultural and academic boycotts too could have an effect (though much of it disproportionately targets Israelis who oppose their government’s policies). Still, given the basic structure of the Israeli trade, the threat to the Israeli economy is a far cry from that often described by both supporters and detractors of BDS. More than anything, this is a cultural, psychological battle, not an economic one. The data suggests that, economically, anything short of official sanctions by important economic partners such as the United States or European Union would be unlikely to produce anything near the kind of economic pressure BDS supporters envision. Moreover, if such sanctions were enacted along BDS (as opposed to E.U.) lines, it would likely strengthen Israeli suspicion of the goals and motivations of BDS, making them—the key of BDS’s strategy—less willing to cooperate. The Israeli government is thus doing itself a disservice by paying so much attention to this movement, both through its own deeds and words, as well as through lobbying with other countries to enact anti-BDS legislation. It is only providing more fuel to a fire that is small to begin with. The sad irony is that campaigns by both well-meaning and not-well-meaning individuals around the world may make it harder, not easier to achieve a very worthy goal: Palestinian independence. Let us be clear: For the sake of both Israelis and Palestinians, Israeli rule over Palestinian lives in the West Bank should indeed end. BDS, whatever the motivations of its various activists, is not the way to promote that goal. Palestinian activists hold posters during a demonstration calling for a boycott of Israeli products in the West Bank city of Nablus. t calls for setting up a not-for-profit organization whose board will be made up of government officials and donors from abroad, the report said. The board will oversee the first major “civil-society infrastructure servicing the State of Israel and the pro-Israel community in the fight against the de-legitimization of Israel,” the notice sent to ministers read. Students protest at an anti-Israel demonstration at the University of California, Irvine.